JoAnn Fabric and Crafts will be open at 6:00am on Friday morning. They have a really great ad with huge money saving coupons. They will have a 50% off one regular priced item and a 25% off your total purchase coupon. The 25% off coupon does exclude their “doorbuster” pricing but you should still find some good deals. Here is a sneak peak at the JoAnn Black Friday Ad. Below are a few of the top deals from their ad. 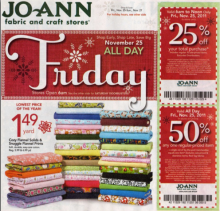 Offers Nov 20, 2011 in BlackFriday, JoannFabrics · Expired! I spent a good part of my weekend at the craft store. These coupons will come in handy next weekend I’m sure. Here are 6 coupons for Joann’s crafts. The Joann coupons expire on Saturday March 13th. Coupons Mar 8, 2010 in JoannFabrics · Expired!